This past week was very busy with work (yesterday was my last day at Soma), catching up from the quilt show, catching up from the daughter and granddaughters being here and getting organized for the upcoming week. "Under the Sea" is a upside down mini-quilt (9x12) that spun off from my "Outside In" quilt. I haven't finished it yet, but hopefully I will sometime beading on it this weekend, definitely this next week. It is due to SAQA-TX by the 28th for the SAQA-TX exhibit of 9x12's at the International Quilt Festival. I have a sunflower quilt also and need to get busy on beading the center of it. With so much to do this next week, I couldn't help but add to the mix a 2 day workshop with the Trinity Valley Quilt Guild. Larkin Van Horn is our guest speaker this month and is giving us a 2 day workshop on "Beading is Applique'". I'm so excited to be able to spend two days with her and learn more about beading on my art quilts. 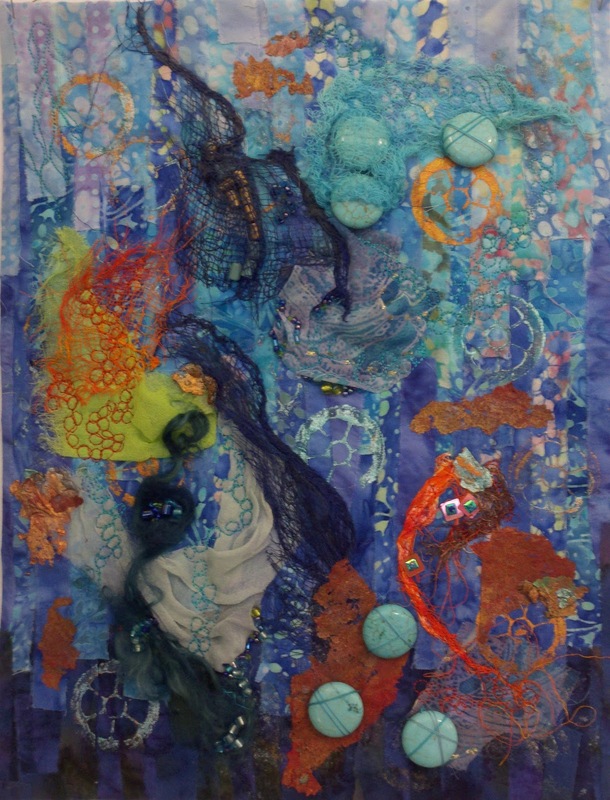 Saturday, Sandra Sider, President of SAQA will be coming to town for critique workshops and a speaking engagement with the Dallas Area Fiber Artists. And she is staying with me! I'm so excited that I get to entertain her for a few days and bask in her knowledge and expertise. Saturday night I have invited DAFA and local SAQA members to my home for a cookout and a get-to-know Sandra evening. Our new grill has been completed, so we are going to get the chance to test out massive grilling on it and enjoy our fire pit with great conversations. If you are a local SAQA member, contact me and come for the cookout Saturday night!